If you are not yet signed up for the email list, please do so by clicking on the Join Newsletter List button provided above. The archive of previous issues can be found at the bottom of this page. also join in the telling. Telling the story is necessary on some level for healing to occur. These days I hear the spring birds singing in the morning, and my response is, “winter’s back is broken.” I know that no matter how much snow can pile upon us, winter’s back is truly broken Even if the weather twists into a cold snap, my refrain is that winter’s back is certainly broken. And what of bipolar disorder? Can its back be broken in our lives? How do we come through the storms of mood without losing hope for the coming springtime of wellness? Bipolar Disorder, Type II — How is it like Rodney Dangerfield? Rodney Dangerfield was an American comedian and actor best known for his catchphrase, “I don’t get no respect”. It can seem the same with Type II bipolar disorder. So what is the power of bipolar disorder, Type II? How is it different from Type I? Why is it a challenging diagnosis? 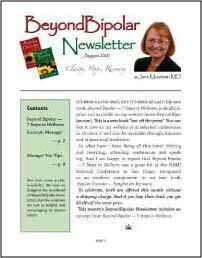 This newsletter is an excerpt from Dr. Mountain's new book, Beyond Bipolar—7 Steps to Wellness. It is about finding ways to manage and not just cope. Under the best of circumstances, psychiatric medications are easy to use. More commonly they are a wild family of cousins that don't behave the same for each person. Patience is required to find the right combination of medications. This newsletter presents two articles about celebrating the holidays while living with bipolar disorder. The first is for individuals with bipolar disorder and the second is for their family and friends. Whether you are someone with bipolar disorder or a supporter of someone else, this newsletter presents tips to help you identify a support group that is focussing on recovery. In the midst of the challenges of bipolar, hope is elusive. But beginning to nurture hope is the first step in finding mental wellness. A diagnosis of bipolar can be frightening. Our experiences can be confounding. But hope can take us in the direction away from our fears since hope is where the health is.